End of the Line album, released July 4, 2014, is a musical autobiography of Richard Del Connor as he became the "Kung Fu Cowboy" stagehand from Las Vegas to San Diego. The album by American Zen includes songs for the Kung Fu Cowboy movies. With Richard Del Connor operating all of his companies single-handed... company distinctions blur as Richard gets the job done. Shaolin Pictures = movie/video production. Shaolin Records = music/record production. Coyote was really stung in the neck two weeks after screenplay writing began. This was included in the movie and now Coyote has ghosts popping out of his body doing his Kung Fu fighting for him. 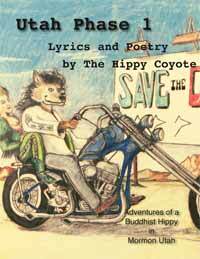 American Zen was founded in 1992 when Richard Del Connor/The Hippy Coyote was stranded in Salt Lake City, Utah. With a couple albums of songs written during the first year, Coyote created the band American Zen to be a 4-piece classic rock band in which he fronted the band on vocals, flute and acoustic guitar. 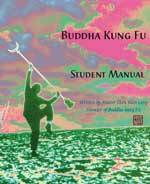 Buddha Kung Fu was founded in 2008 with the release of the Buddha Kung Fu Student Manual by Buddha Zhen. Combining most of the Yang Tai Chi and Shaolin Kung Fu of Shaolin Chi Mantis, Buddha Zhen creates his Shaolin Kung Fu school for "building Buddhas" that is "doable for Americans." This traditional Chinese Kung Fu school was founded in 1992 to include the three martial arts styles of Buddha Zhen: Shaolin Kung Fu, Praying Mantis, and Yang Tai Chi. Shaolin Communications is the parent company of all of Richard Del Connor's enterprises except Tai Chi Youth which is independent as a nonprofit corporation. Shaolin Music was founded with the album, TEMPTATION by Richard O'Connor and The Rich in 1984. Shaolin Pictures produces music videos, feature films, commercials, and education videos for Kung Fu and Tai Chi. Shaolin Records was founded in 1984 with the release of TEMPTATION by Richard O'Connor. In 1996 Shaolin Zen emerged from Shaolin Chi Mantis Traditional Buddhist Gongfu and Tai Chi Youth was launched as a nonprofit organization. This Salt Lake City Sangha of Shaolin Zen Buddhism is almost a religion as Buddha Zhen "tests his Zen Buddhism on his students." Tai Chi Youth is a 501(c)(3) corporation that has taught Tai Chi programs in schools, churches, elementary schools, middle schools, high schools, continuning education programs, and prisons. Richard Del Connor became "Coyote" in 1984. In 1985 he needed a first name so, "The Coyote." In 2007 his name altered once more to "The Hippy Coyote" for better internet usage. Currently, in late 2014, Coyote is performing solo as "KUNG FU COWBOY." 4 Decades of Love is a songbook of lyrics with guitar chords. 4 decades of Coyote love life are summarized with a song for each lover. Originally created for a Freemason fundraiser, this set list became a handwritten lyric book that became this guitar songbook. 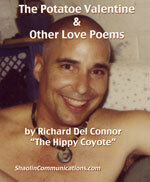 Autumn Flavours is the first book of poetry written by Richard Del Connor, The Hippy Coyote. Richard Del Connor became Shen-Lang Zhen, which the Chinese say as, "Zhen Shen-Lang," or "Zhen Shifu." Buddha Zhen began teaching Shaolin Kung Fu in 1984 and never stopped. 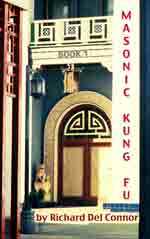 The Buddha Kung Fu Student Manual was written to launch his newly founded Buddha Kung Fu schools in 2008. 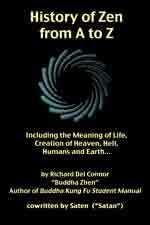 A complete 40-page history of Buddha Zhen is in section 2 of the book. During the 1980s, while Richard Del Connor was attending UCLA Motion Picture Program, he started picking up some quantum physics books. Richard has several theories about physics and the cosmos, including his theories on gravity. 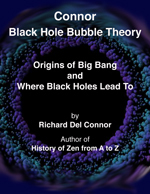 The Black Hole Bubble Theory book was written for Professor Steven Hawkings to help him with some problems in his black hole theory. Richard explains that we are in a bubble floating in a super dense black tar. Richard stumbled into Heaven one night. Richard was ushered out of Heaven--by Satan. Richard had questions for Satan who did not seek fear or worship. He agreed to tell Richard the history of the universe, which he dictated telepathically through words and images--yet somehow his son interupted them and asked who was talking to his daddy. While Richard practiced his Shaolin Kung Fu and studied for his Freemason 3rd Degree Proficiency Test... he discovered that one of his Kung Fu Forms contains all the secret dugards, signs, and symbols of modern Masonry. Then Richard discovered a section of the form that is a reenactment of the murder of Hiram Abif. Richard's study into the history of this Kung Fu uncovered information about China before and after WWII. So Richard wrote this novel about teenagers learning British Freemasonry as they are pursued by Japanese soldiers. Richard's mind in 2011 was rich with poetry, Shakespeare, and the books he was studying to establish his nonprofit organization, Tai Chi Youth, in the Montrose area. 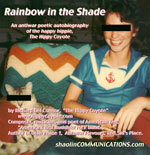 In romantic loneliness Coyote wrote this epic poem of love, passion, remembrance, and desire. Richard Del Connor was the last year of the Vietnam draft as he turned 18 in 1972 and watched the ping pong ball roll down the shoot. Fortunately, Coyote was a high enough number that he wasn't summoned to cut off his hair to murder Asians. 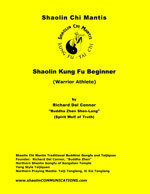 Shaolin Kung Fu Beginner is an excellent book for learning Shaolin Kung Fu. Buddha Zhen has insured that life issues, mental issues, emotional issues and health issues are addressed by each student. Balancing the mind/body/spirit of each student requires each student to gain control of their mind, body, and spirit. This book makes this happen as the student answers the questions in the book and discusses them in class with the Shifu and other students. Tom Calder's life in the pyschedelic sixties of California. Richard Del Connor was exiled from the United States in 1970 for drug trafficking. Taking refuge in St. John's, Newfoundland, Coyote changed his hippie rock'n'roll life into an academic life. 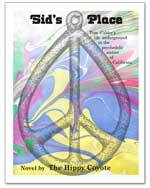 Sid's Place is a book about what "might" have happened if Coyote had stayed in San Diego instead of being exiled to Canada. Tom Calder is a drug runner who is pursued by hitman Sid and the police. After working several days for the Kenney Chesney concert at Anaheim Stadium in 2013, our Zen dog is taken to a Hare Krishna Temple for dinner. Coyote didn't join the religion but he loved their book, Bhadavad Gita. This Vedic scripture inspired him so much he read it again and took notes. On the third and fourth passes through the book Coyote began to summarize and quote from the book as he wrote his daily journals. Eventually, his journals and spiritual study merged into one activity: Supersoul 13. Written in 1992 and published on the prison printing press for his first batch of inmate students, Buddha Zhen established his Tai Chi Beginner book as an effective tool for teaching Yang Style Tai Chi. Shaolin Chi Mantis, Buddha Kung Fu, and Tai Chi Youth teach the Yang Style Tai Chi Short Form in 16 sections over 16 weeks creating 4-month semesters. 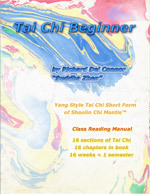 Tai Chi Beginner is 16 chapters that expect the corresponding section of the Tai Chi form to be taught on the day that chapter is read. The first two American Zen albums, LEVEL 1 = Peace of Mind, and LEVEL 2 = Christ Killer, had some songs that weren't recorded or included on the albums or later albums by American Zen. These omitted songs and aome poems of this same time period of moving to Utah are included. Utah - Phase 1, was the original title of the Peace of Mind album. Links to END OF THE LINE EPK webpages. High quality graphics for feature editors. Distributor information about release and promotion plans. Links to END OF THE LINE lyric webpages. Links to AmZen_eNEWS newsletters of 2012, 2013, and 2014. Links to PR_AmZen press releases from Shaolin Records of 2012, 2013, and 2014. Shaolin Records Studios: "Tacoma Studios"
Mixing was not completed and album mastering was minimal using Apple Logic. Recorded in Coyote's truck, (where he's been living past couple years). American Zen records the most "danceable rock songs" ever. With two guitarists, bass and drums, The Hippy Coyote returns to his old school heroes of The Beatles, Blue Cheer, The Rolling Stones and Jimi Hendrix to create a new classic rock album. 11 rock songs tell the story of Coyote's "nomadic" journey since Christmas 2011 when he left his kids to start a Shaolin Kung Fu school in Las Vegas. End of the Line music album by American Zen tells the musical autobiographical story of The Hippy Coyote from the time he divorced his family in 2011 to the end of 2013. Coyote recorded this album in his truck where he's been living the past couple years. This is Coyote's first album without an acoustic guitar and it sounds powerful as he takes on the musical alter-egoes of his American Zen bandmates. End of the Line music album by American Zen is the first album of American Zen without any acoustic guitar. 11 songs tell the story of The Hippy Coyote, known currently as "Kung Fu Cowboy." Songs depict homeless life and his upcoming movie, KUNG FU COWBOY ROCK & ROLL MOVIE 1, starring Coyote with 21 songs of his in the soundtrack. End Of The Line follows the 2012 release of Coyote Radio Tujunga by THC The Hippy Coyote and the last released album by American Zen, LEVEL 4 = Kung Fu Cowboy PART 1: King Solomon's Temple in 2010. Both of these previous albums, also written by Coyote, are based upon the life events of T.H.Coyote, known mostly as "Kung Fu Cowboy" since 2012. End Of The Line is a musical autobiography of Coyote since he became "nomadic" in 2011. Starting with the song, "Use Me," Coyote tells how he became homeless and stranded in Las Vegas. The next song, "High School Reunion," was written as Coyote reentered the town of his birth for his 40-Year High School Reunion. Coyote continues to perform all the instruments under the pseudonyms of his music alter-egoes; Steve Hixon on drums, Tom Calder on bass, and Rory G on electric guitar. The songs were written on the tailgate of his truck, and in February and March of 2014, Coyote recorded all 11 songs in his truck. The drums had to be recorded in his daughter's living room while his truck was getting a new head gasket. The final guitar playing through his vintage 1978 Marshall amp was recorded with the flutes in an empty apartment in Van Nuys where Coyote could turn his amp up to "11." The bass, vocals and rhythm guitar tracks were recorded in Coyote's Toyota Tacoma using his sleeping bag for insulation... We now refer to the truck as, "Tacoma Studios." Coyote originally intended this to be a solo record of his recent solo performances on electric guitar and flute. "It just made sense to keep going," explains Coyote. "Opportunities just kept opening up and one of my Kung Fu students bought me the Zoom 4-track recorder for Christmas. The album just kept growing--with a life of its own." End Of The Line is the 5th album release of American Zen. With the return to 4-track recording, this album has a simlar rock honesty as the LEVEL 1 = Peace of Mind album by American Zen. "This album represents my final departure from folk rock," says Coyote. "Since 1994 I've been striving to revitalize or bring back folk rock music. It didn't work. As you can see the world has chosen bombs, bullets, rap cussing and digital music from kids who can't play a single instrument. Folk rock is dead, and I couldn't resurrect it." Coyote was the host DJ of the Folk Rock Podcast of Shaolin Records for several years. "I'm a rocker now," states our hippie dog. "I will never play an acoustic guitar again." That's okay. Coyote shreds on guitar. End Of The Line will be the album used by future generations of guitar players to learn their rock riffs and form their own 4-piece rock bands all over the world. "This album will be used for Rock Hero," states Scott Karahadian confidently. End Of The Line album, released June 2014, will also be promoted and marketed as Coyote releases and promotes several other projects. 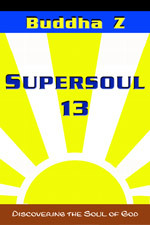 Supersoul 13 is the spiritual journal written by Coyote in 2013 while completeing the End of the Line album. This book provides details of the album being written, and any fan of the album will want this book. Supersoul 13 is being released exclusively through amazon.com. Coyote is a Tai Chi and Shaolin Kung Fu master teaching under the name, Buddha Zhen or Buddha Z . As founder of several Kung Fu schools, including the Tai Chi Youth nonprofit education organization, Coyote has become famous as the "Kung Fu Cowboy." Already featured in Kung Fu Masters Magazine, Coyote will star in the movie written about him, Kung Fu Cowboy Rock & Roll Movie 1 , currently in production as this album is released. The song, "Kung Fu Cowboy 2," was written with phrases and lyrics that only a Kung Fu practitioner would know: "Rooted to the Earth in a horse stance," "Don't fight--we play around," "Trees are my punching bags," and "Qigong and a bong--for energy!" 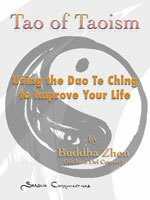 portraying the modern Kung Fu hero as a person who enjoys life as much as possible--in a healthy way. So, during his three years of being homeless, Coyote has been stung by a scorpion in the neck, released 19 books in Kindle format, written and recorded the End of the Line album, written and published Supersoul 13 book, written the screenplay for Kung Fu Cowboy Rock & Roll Movie,1, and worked as a stageheand wihile teaching Tai Chi and Shaolin Kung Fu private lessons. Coyote has released more products while sleeping in his truck for the past 3 years than Coyote has released in the previous 30 years of sleeping in nice warm houses. "Hey! That doesn't mean that I'm better off homeless! I'm just not having to cook, clean, change diapers and help with homework every day. I've been on my own since Christmas 2011. It's great having more time to write, record, and play music, BUT I NEED MY STUDIO BACK! I need a home! I need a kitchen..."
So the world's new rock star is The Hippy Coyote, the Kung Fu Cowboy of American Zen, "America's first Buddhist rock band™." This is probably the first time in history that a 60-year old homeless hippie emerged onto the radio and record charts to become a pop star. Baby boomer resurrection? Maybe. Certainly a scorpion resurrection. Upcoming and past concerts of THC The Hippy Coyote or as "Kung Fu Cowboy"
1. Coyote with kids "The family that Kung Fu's together -- stays together"
2. Coyote with Family doing Tai Chi "Buddha Kung Fu Parade 2007"
3. Coyote swordplay photos "Kung Fu Cowboy Chinese Weaonry"
4. Coyote weapons photos "Kung Fu Cowboy Chinese Buddhist Diplomacy"
PDFs of the album covers are provided for fans who purchased American Zen by downloads instead of CD. Coyote enjoys many art forms and mediums. Information about American Zen formation in 1990s. Coyote enjoys working in Photoshop and Illustrator to create interesting artworks. Shaolin Kung Fu and Yang Tai Chi of Shaolin Chi Mantis and Shaolin Zen. During the 1980s, Coyote was a professional photographer. TAGLINE: "Rocktography by The Coyote"
Official product page of Shaolin Records for selling the album. Each LEVEL has its associated projects listed in groups. Shaolin Pictures started in music videos, then produced instructional videos for Shaolin Kung Fu and Tai Chi lessons. In 2013 Shaolin Pictures began production of the feature film, Kung Fu Cowboy Rock & Roll Movie 1. With several sequels and four other movies in preproduction, Shaolin Pictures is planning to be the "birth of new faces." Richard started at UCLA in 1984 and graduated the Motion Picture Program with a 3.6 g.p.a. in 1987. During this time Richard began working in music videos, commercials, and special effects studios in Los Angeles, California. As a production assistant, gaffer, lighting director, photographer, cinematographer, grip and electrician--Richard learned more than the basics of movie production, acting, and editing. During 1990s Richard produced several martial arts instruction videos. In 2001 Richard launched the Coyote Radio television shows that featured performances by himself and his children. Shaolin Pictures was launched in 1984 along with several other Shaolin enterprises of Richard Del Connor that include Shaolin Records and Shaolin Music. Richard Del Connor graduated UCLA Motion Picture Program in 1987. Enrolling in 1984, Richard sought the means and knowledge necessary to produce his current rock opera, Coyote in a Graveyard. During the 1990s Shaolin Pictures produced several Kung Fu and Tai Chi videos for Shaolin Chi Mantis Traditional Buddhist Gongfu. In 2001, Richard began producing live cable television shows in Tujunga, California. Currently, Shaolin Pictures is seeking the funding required to produce a half-dozen movies and 66 videos for learning Tai Chi and Shaolin Kung Fu.